Carretera de Baconao km 38 1/2, Sigua. 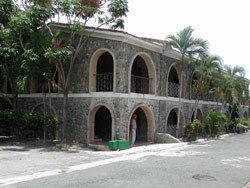 Santiago de Cuba. Cuba. Hotel Costa Morena, 30 minutes from the city of Santiago de Cuba, in the Biosphere Reserve of Baconao Natural Park, the Costa Morena captivates with its exceptional location and conditions. 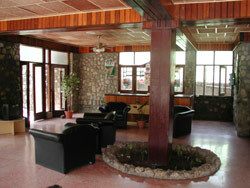 It is an ideal place to relax by the Caribbean Sea which is calm and placid here. You can also practice nautical sports. The facility provides easy access to trekking and to visit Parque Baconao, the Aquarium, the Rodeo, the Cactus Garden, the Baconao Lagoon, the Prehistoric Valley, numerous nearby beaches and many other options. The varied animated shows and the smiles of the local people, are more than enough reasons to return again and again to this enchanted spot by the sea and in the midst of nature. 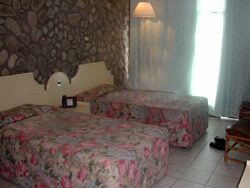 115 air-conditioned rooms overlooking the sea, satellite TV, radio, telephone. Others: Cuban food and international cuisine restaurants, cafeteria, bar, snack bar, grill, natural and artificial swimming pools, party room, game room, nautical sports, massage, mail service, shop, laundry, safe, currency exchange, parking and car rental. No reviews for Hotel Costa Morena yet.